Prior to the organization of the round table to mobilize resources to finance the 2016-2020 national and multisectoral nutrition plan, scheduled on September 15 and 16, 2016 in Abidjan, a media training workshop on nutrition took place Tuesday 30 and Wednesday 31, August, 2016, in Grand-Bassam. Twenty-three (23) journalists from the online, radio and print media in Côte d’Ivoire took part in this capacity building workshop, organised as a joint initiative by the National Nutrition Committee (NNC) and the United Nations Food and Agriculture Organization (FAO). The nutritional situation in Côte d'Ivoire remains a matter of concern despite the government efforts and other parties involved in nutrition. Faced with this situation, the Ivorian Government has decided to make the fight against malnutrition a priority, emphasizing the need to develop a multisectoral and multi-player approach. Therefore, it has authorized the organization of a round table of technical and financial partners (15 to 16 September 2016) for the mobilization of resources to finance the National and Multisectoral Nutrition Plan (NMNP). "The activity that brings us together today is of major strategic importance to the fight against malnutrition in our country. This fight needs the gathering of all our forces and particularly the national media, "said the deputy chief of staff to Prime Minister Koffi Ahoutou Emmanuel for whom, malnutrition is the cause of many deaths, particularly women and children. "A Better visibility through good communication on nutrition and challenges of the Roundtable to finance the National and Multisectoral Nutrition Plan 2016-2020, requires the mobilization of all the media players. (...) This, to provide the fourth power, the one from the press and the media in general, with the tools to a greater contribution to the fight against malnutrition in our country, "he said. For Dr N'goran Teckly, Côte d'Ivoire is facing a double burden, under nutrition and over nutrition. And many babies are born with low birth weight. For Luc Genot, representing Mr. Germain Dasylva, the FAO Resident Representative in Côte d'Ivoire, chronic malnutrition affects nationwide one in three children under five on three. Nutrition has become a national priority. And for this, much work remains to be done to meet the 2025 targets of the World Health Assembly for Nutrition. The contribution of all sectors, namely agriculture, health, social protection, health and sanitation, education, will be crucial to address this problem. 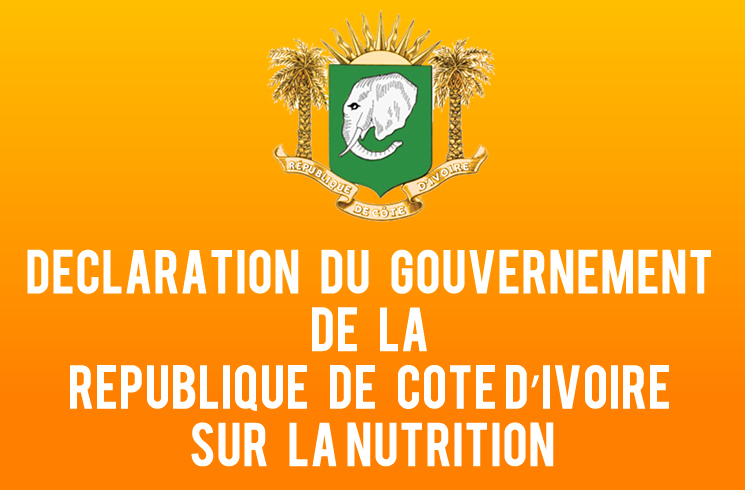 The objective of this training is to raise awareness on the nutritional situation in Ivory Coast, to provide the necessary knowledge concerning the multisectoral approach and enable the regular release of articles on nutrition.